Daughter of Pietro Barba, an appelate court judge. Raised in Palermo, Sicily. She made her first Communion at age 10, and had an intense devotion to the Eucharist from a very early age. At fifteen she felt a call to religious life, but her family, though pious, opposed her vocation. She was 35 when she was able to follow the call, and she entered the Discalced Teresian Carmel at Ragusa, Italy on 25 September 1919, taking the name Maria Candida of the Eucharist. Eucharistic devotion dominated her spiritual life, and she would spend hours before the Host. Prioress of her house from 1924 to 1947. Greatly expanded the Carmel in Sicily, and promoted devotion to Saint Teresa of Jesus and her Rule within her Order. Wrote a small book titled The Eucharist, a description of her experiences and theological meditations on them. Son of Francis, a wealthy lawyer and notary, and Brunora Ravelli Bertoni, he was raised in a pious family. His beloved sister died when Gaspare was quite young. He was educated at home, then by Jesuits and the Marian Congregation at Saint Sebastian's School in Verona, Italy. At his first Communion Gaspare received a vision and message that he was to become a priest, and he entered the seminary in 1796. On 1 June 1796, troops from Revolutionary France began a 20 year occupation of northern Italy. Gaspar joined the Gospel Fraternity for Hospitals, and worked to help those wounded, ill, displaced, or otherwise harmed by the occupation. Ordained on 20 September 1800. Chaplain to the sisters of Saint Magdalen Canossa convent. Spiritual director to many including Blessed Leopoldina Naudet, Venerable Teodora Campestrini, and an entire seminary. Well known preacher. One of the leaders in a Europe-wide movement to offer prayers and support for Pope Pius VII when he was imprisoned by Napolean Bonaparte. Established the Marian Oratories. Organized free schools for the poor. Spread devotion to the Five Wounds of Christ. Founded the Congregation of the Sacred Stigmata of Our Lord Jesus Christ (Stigmatines) on 4 November 1816. Their mission was to serve as "Apostolic Missionaries for the assistance of bishops", and they were under the patronage of Mary and Joseph. Beset by fevers and a continuing infection in his right leg during the last two decades of his life. Over 300 operations were performed on his leg in an effort to stem the infection. Continued to serve as counselor and spiritual director from his hospital bed. Studied at the Collegio Romano in Rome, Italy; his classmates included Saint Gaspare del Bufalo and the future Pope Gregory XVI. Influenced by the work and preaching of Saint Vincent Mary Strambi. Became a Passionist novice at Monte Argentario in 1801, and made his profession on 20 November 1802. Ordained on 29 December 1805. For seven years the house and all the religious in it were suppressed by order of Napoleon. When Lorenzo was able to return to his vocation, he devoted himself to preaching missions and promoting devotion to the Passion. Showed a great personal devotion to the Child Jesus. Rector of the Passionist Generalate in Rome (his vice-rector was Blessed Dominic Barberi), but spent nearly every day on the road preaching missions. The son of Atyuppius and Elizabeth. Priest. Cardinal. Papal treasurer. Elected pope the day after his predecessor's burial, probably so there would not be any outside interference with the decision of the cardinals. Upon his election, he sent Charlemagne the keys of Saint Peter and the standard of the city of Rome, Italy indicating his choice of Charlemagne as protector of the city and the see. Charlemagne, with his letters of congratulations, sent a fortune which Leo used to build churches and found charitable institutions. On 25 April 799, members of Pope Adrian I's family hired thugs to attack Leo in a procession. They scarred his face and tried to tear out his toungue and eyes to render him unfit for the papacy. He survived the attack, scarred but tongue and eyes miraculously healed. He fled to Charlemagne's protection at Paderborn, Germany where his enemies tried to turn the king against him. When Leo recovered, Charlemagne escorted him back to Rome. In 800 he conducted a trial of Leo and of his accusers. There was no evidence of Leo's guilt, but there was of his accusers, and they were imprisoned. On Christmas day in 800, Leo crowned Charlemagne emperor, marking the beginning of the Holy Roman Empire. Hermit for 70 years in the desert near Thebais, Upper Egypt. He sought to imitate the solitude and privations of Saint John the Baptist, and lived on the the fruits of a date tree and a palm-tree that grew near his cell. Popular in the Middle Ages, initially with monks and then in general, he became associated with weavers because he was depicted "dressed only in his own abundant hair, and a loin-cloth of leaves". Antonia early felt a call to religious life, and as a teenager began caring for and catechising children in her village. Attended the Institute in San Giorgio Canavese, simultaneously a student and a teacher. In 1806, she and several companions formed a group that would become the Institute of the Sisters of Charity of the Immaculate Conception of Ivrea, dedicated to teaching and catechising children, and home care for the sick; in 1819 they opened their first home, on 7 March 1828 King Charles Felix gave secular approval, and on 10 June 1828 her bishop gave his approval. Antonio spent the rest of her life, and ruined her health, in leading, promoting and expanding the Institute. Her legend says that she was a princess in the region of York, England. One of the holy virgins who travelled with Saint Ursula, she was saved from the massacre by the Frisian king Radboud who took her to his castle in Rhenen (in modern Netherlands) where she eventually ran the household. Queen Aldegonde became jealous, and had Cunera strangled and buried in a cattle shed. A miracle led to the discovery of the crime, which led to the conversion of Radboud to Christianity. There are a number of problems with this story, and nothing reliable about her has survived. Wealthy layman known for his charity to the poor. 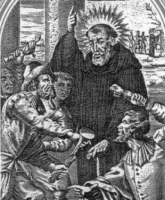 After hearing a sermon by Saint Francis of Assisi, he gave away the rest of his riches and became a Franciscan tertiary, received into the order by Saint Francis himself in 1211. Priest. Hermit near Cortona, Italy living in a cell on a bridge. Miracle worker. French nobility. Pious and studious youth. Augustinian priest. Curate of Oresscoth in Brabant. Worked with Saint Frederick of Utrecht to evangelize the Frisons. Canon of the cathedral at Utrecht, Netherlands where he worked to set a good example of prayer and fasting to laymen. Founded the Augustinian monastery at Stavoren. Nun in 1873. Founded the Institute of the Sisters of Saint Mariana of Jesus (Marianitas Sisters) to care for and educate orphans and poor girls, and to help prostitutes escape the life. Born to the French nobility. Mercedarian knight. In 1300 he ransomed 228 Christians enslaved in Tunis, Tunisia by Muslim raiders. Returning to France, he was sent to Algiers, Algeria where he ransomed 218 more. 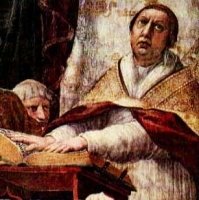 Priest during the reign of Valerius Maximianus Galerius. Earliest known bishop of Epiphania, Cilicia (in modern Turkey) in 325. Attended the Council of Nicaea. Bishop of Nicomedia; opposed the Arians who were just starting to spread in the area. Writer whose works were recommended by Saint Athanasius of Alexandria for their defense of the faith. Suffered in the persecutions of Diocletian. First hermit on Mount Athos in 8th century Greece. Legend says that he was a soldier captured by Muslims, but freed through the intercession of Saint Simeon. He made a pilgrimage to Rome, Italy and was given a monastic habit by the (unnamed) pope. Moved by a vision of the Blessed Virgin Mary, he became a hermit for 50 years on Mount Athos, fighting off assaults of the devil and starting a tradition for other hermits to follow. Missionary, working in Sweden with Saint Ansgar. Bishop. He converted so many pagan Swedes to Christianity that he was condemned to death by King Swerker the Bloody. Martyr. Monk on Mount Athos in Greece for three years. Monk at the Valaam monastery in northern Russia. Founded a monastery in the island of Konev, putting it under the Rule he had learned on Mount Athos. Spiritual student of Saint Amandus of Belgium. Benedictine monk at the monastery of Elnone (modern Saint-Amand-les-Eaux) in Tournai, Flanders (in modern Belgium). Provost of the abbey of Marchiennes near Douai, France. Born a princess, the daughter of Briga and King Conall Derg of Oriel in northern Ireland. Sister of Saint Fanchea of Rossory, Saint Carecha of Clonburren, Saint Darenia of Cashel and Saint Enda of Arran. No details of her life have survived. Born to a working class family. Became a Cistercian monk at Saint Nicholas, Corno, Italy. Lived as a hermit at Ocre in the Abruzzi region of Italy. Founder and abbot of Santo Spirito monastery near Val d'Ocre. 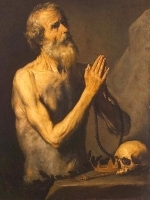 As a self-imposed penance, he slept standing the last 37 years of his life. Premonstratensian monk in 1641. Canon of the Strahov monastery outside Prague, Bohemia (modern Czech Republic). Ordained in 1647. Prior of his monastery. Spiritual director and confessor to the sisters in the Doksany convent. Daughter of Domenico Leonti and Bernarda Maiolino; sister of Blessed Angelica of Milazzo. Franciscan Minim tertiary lay woman. Her guardian angel was sometimes visible to other people. 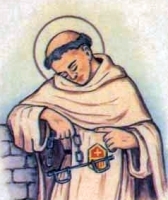 Mercedarian friar. Ransomed 80 Christians from Muslim slavery in North Africa. Fifth-century missionary bishop to the Picts in Scotland, consecrated by Saint Palladius of Ireland. He used Abernethy, Scotland as his base of operations. Founded the monastery of Culross in Fifeshire, Scotland. Brother of Saint Malachy of Armagh. Influential bishop of Clogher, Ireland in 1126. Martyred in the persecutions of emperor Hadrian. Bishop of Aenos, Rumelia (modern Enez, Turkey). Contemporary of Saint Athansius. Strongly opposed Arianism, and was driven from his diocese by the Arian emperor Constantus. Bishop of Chalons-sur-Seine, France in 864; he served the last 21 years of his life. Seventh century confessor of the faith. No details about him have survived. Four members of the Imperial Roman nobility. They were all soldiers, one or more may have been officers, and all were martyred in the persecutions of Diocletian - Basilides, Cyrinus, Nabor and Nazarius. Three Christian men who became Benedictine monks at the Saint James Abbey in Regensburg, Germany, then hermits at Griestatten, and whose lives and piety are celebrated together. - Marinus, Vimius and Zimius. Among the millions murdered by Nazis in World War II, many were Poles killed for being Poles, and many were Catholics killed for being Catholic. As emblematic of this group, 108 Polish Catholics who were murdered for their faith, and whose faithfulness was attested by by witnesses, were beatified as a group of by Pope John Paul II. They each have a separate memorial day on the calendar, and a separate profile in this system, and will appear on the appropriate pages as the calendar rolls around, but they are celebrated as a group today.